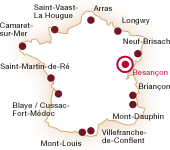 Besançon lies in an exceptional strategic position, which Julius Caesar had already noticed: the River Doubs encloses the city in a loop closed off by a hill. Here Vauban was to find a town that had been fortified since ancient times. Forever striving to adapt to the terrain, he improved some buildings and designed new ones, thereby totally reshaping the defence system of the town. Vauban built the citadel on a rocky spur that he made higher to protect it from the Chaudanne and Brégille hills. He transformed Battant’s medieval town wall with bastions, curtain walls and demi-lunes dominated by Fort Griffon, a second citadel facing the first one. Vauban optimised the defence of the heart of Besançon by inventing a new model of canon tower: the bastioned tower. He built six of them firmly anchored into the river and facing the hills which dominated the town. The fortifications of Besançon were finished in 1693 after almost 20 years of work. They cost the royal treasury so much to build that Louis XIV wondered if the citadel was not made from gold.